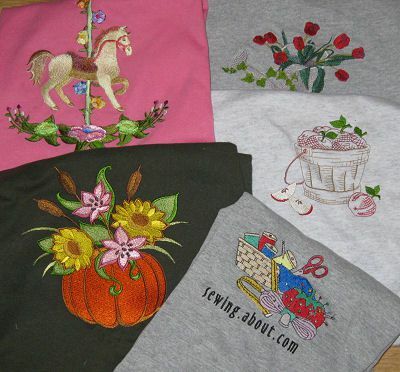 The most common complaints about machine embroidery on tee shirts and sweatshirts is that the embroidery is stiff and the embroidery doesn't drape like the rest of the garment. Everyone wants a soft pliable easy to wear tee shirt or sweatshirt, not a stiff shirt. Embroidering a finished garment is a bit more challenging than embroidering a piece of fabric and then transforming the fabric into a garment but it is not impossible. It is successful when you take your time hooping and stabilizing the shirt. The design you choose plays a large part in how the shirt will drape when the embroidery is finished. If you choose a design which is very dense stitching and the design is so large that it will take up a considerable amount of the garment, it will effect how the garment hangs. Start with things like red-work designs, similar to the apple basket embroidery shown in the photos, that are not dense but will give you the opportunity to experiment with hooping and stabilizing options. Stabilizer plays a major role in machine embroidery. My personal favorite for machine embroidery on tee shirts and sweat hirts is a woven heat-away stabilizer. This stabilizer will vanish when the stitching is done but is less apt to stretch or flex while the shirt is embroidered. Many people prefer water soluble stabilizer. Water soluble stabilizer also vanishes when the design is done. The advantage of a stabilizer that vanishes is that there is less stiffness added to the design so only the design itself is changing the way the shirt will drape. There more and more stabilizers becoming available to the home machine embroidery market all the time. Take the time to shop around and experiment to find a stabilizer that works well for you with your embroidery machine. Always wash the shirt before you embroider it. This allows the fabric to do any shrinking before it is embroidered. The embroidered designs are not going to shrink with the fabric of the garment. If the shirt shrinks after the design is embroidered the design will most likely pucker and you've wasted time and thread. Here's the step by step way to have successful machine embroidery on a tee shirt or sweatshirt. Press the shirt so it is wrinkle free but do not stretch out the shirt while you iron it. Try the shirt on and mark the placement. Turn the shirt wrong side out. Spray lightly with a basting or temporary adhesive spray. Smooth one to two layers of stabilizer on the area that will be embroidered. Hoop the tee shirt, being sure you are not stretching the shirt while placing the shirt in the hoop or while you are tightening the hoop. Check the placement. If it is not exact, totally remove the fabric from the hoop and start again. Do NOT pull and stretch the shirt into the correct position. Attach the hoop to the machine and make sure only the part of the shirt which is going to be stitched and that the rest of the garment is clear of the hoop. Follow your embroidery machines manual to test the stitching area and stitch out the design.